Wow what a day, we headed south out of Kathmandu for about 25km into the hills that surround the valley. Outside the city the country is really beautiful, lush green paddy fields, dense forest, with tiny villages just about clinging to the hillside and most of all fresh air. The first place we visited was Dakshinkali. Here we found a small temple down a gorge that sits on the confluence of two sacred streams. This temple is dedicated to Kali the bloodthirsty incarnation of Shiva's consort Parvati. As it was a Tuesday there was quite a lot of blood letting going on, I saw 2 kids (little goats not children) being slaughtered. 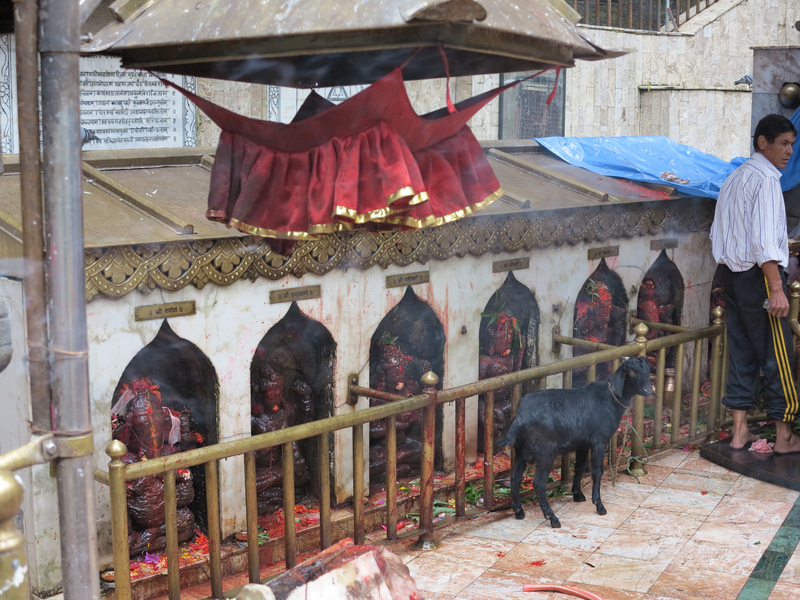 Chandika said that sometimes buffalo are sacrificed at this temple. The temple was a favourite of the Nepal Royal Family, until they were all massacred in 2001! TIP #3 Make sure you hire a guide and driver/taxi and get out of the city as there is so much so see. I learnt so much more from the guide than from the Lonely Planet book! TIP #4 As you can tell I've visited loads of temples, etc. Ensure that you wear shoes that can be easily taken off and put back on again. My walking boots are a bit of a pain for this. Should have brought my sandles. From here we headed back towards Kathmandu and stopped of at a place called Pharping (I though the name was quite funny and had a giggle to myself). 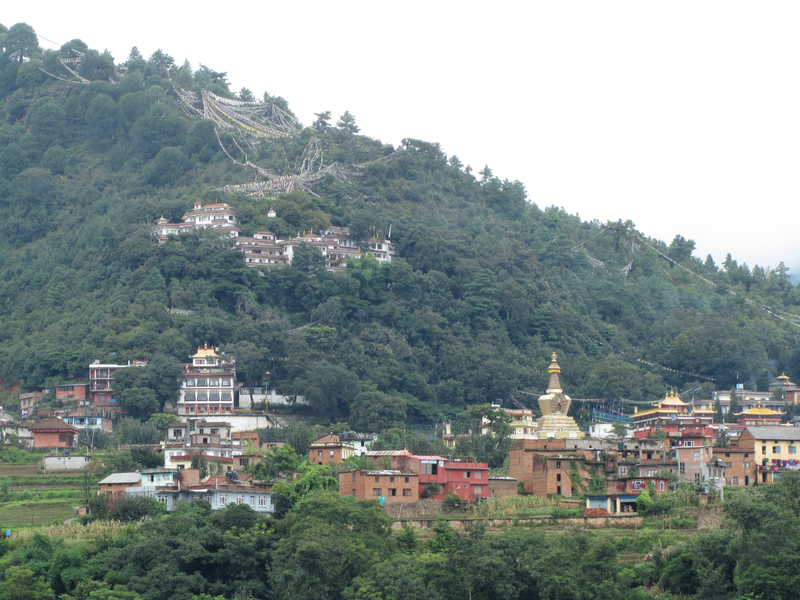 This place is home to quite a few Buddhist monasteries. One of the chörten contained 16 of the biggest prayer wheels I have seen to date. They must have been 2m tall and quite heavy to spin. We wandered our way uphill to the monasteries for a look around. I managed to pick up a couple of bundles of prayer flags for some friends. I should also mention that it was the first day of Teej, the woman's festival. The roads were teaming with Hindu women wear red saris. As part of the festival they fast for 24 hours, sing, dance and worship at the temples and shrines dedicated to Shiva. It was quite fun to watch as everyone was enjoying themselves. We were on the homeward stretch, but first one final stop at the Newari town of Kirtipur. 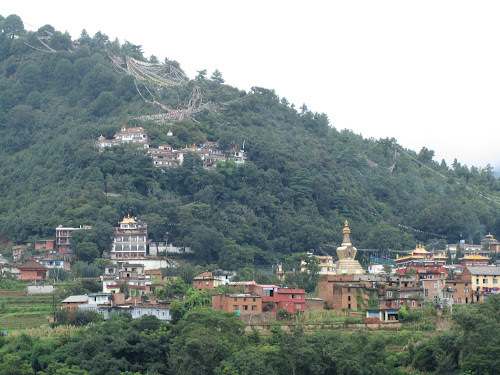 This is another old town with winding streets that has a Hindu temple at its heart, which sits high on a hill overlooking Kathmandu. It's been a busy few days, seeing quite a few sights in and around Kathmandu. I'm having a day off in order to shake my cold and stock up on snacks, then it's off trekking for 17 days. I'm not sure what the Internet availability is like, so I'll update when I can.